Despite the loss, fans at home in Burlington say they are incredibly proud of the team's successes this season. In the first round of the NCAA basketball tournament, the University of Vermont suffered a tough loss. The University of Vermont fell to Florida State in round one of the NCAA Men's Basketball Tournament Thursday afternoon, but drew praise from hometown fans who watched the action on television from Burlington. 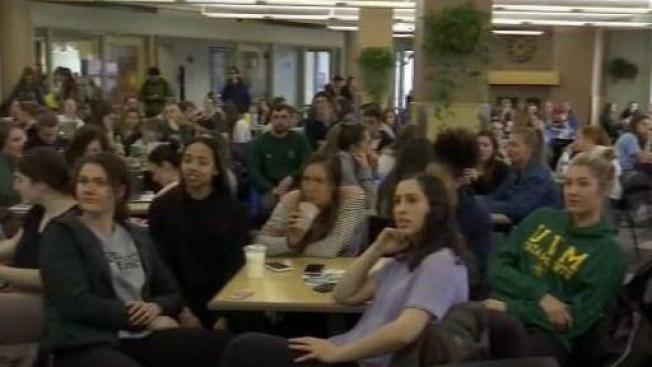 "Vermonters really care about this team — and deservedly so; they're really good people," said Kyle Adams, a UVM senior who was watching the broadcast from the Ri-Ra Irish Pub on the Church Street Marketplace. For much of the game, it was a tight back and forth between the No. 13 seed Catamounts and No. 4 seed Seminoles. They were even tied at the half. Fans were holding out hope for an upset, but ultimately, the Cats fell 76 to 69. "I really thought we were going to do it," shrugged UVM fan Kathy Musinski of Bennington, who was also watching at Ri-Ra. Inside the university's student center, there were celebrations with every Cat bucket. Members of the school's women's basketball team were cheering on their counterparts, and expressing pride in the many successes they had this season. "Everyone in our school wants everyone else to do great," said sophomore Josie Larkins, a member of the UVM Women's Basketball Team. "We're such a big community here that we're really supportive." While their time in the tournament spotlight is over, the good news for the Catamounts is they're a relatively young team. Several standout players, including Anthony Lamb, are expected to return next season.